On Saturday we do a long loop drive via the Chelela Pass, which links the Paro Valley to the one which borders Tibet, and then back round the end of the valley. The pass is at 13,000 feet, and the total distance about 100km, but takes about 8 hours driving!! However the views from the top of the pass are worth it. 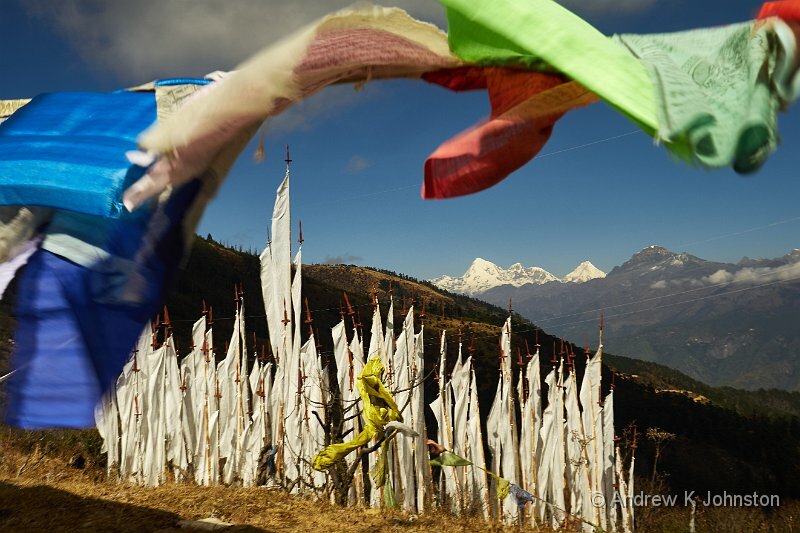 We can see the second highest mountain in Bhutan, which makes for great scenery, and then the area at the top of the pass is completely covered in prayer flags – acres of them. I was a bit concerned before this trip about my fitness, so as things seemed to be going well I decide to walk up to the top of the little mountain above the pass. I didn’t quite finish because I ran out of time, but not puff, so that augers well for the climb to the Tiger’s Nest Monastery at the end of the trip. The afternoon is mainly about the long drive back, although we do get a couple of photo opportunities, with back-lit trees and a rather charming hillside village. Bhutanese mountain roads are single lane, with a wide verge on both sides as often as space allows. Drivers stick to the middle except to pass. This works as traffic is very light, speeds low and most drivers considerate, but it does slow progress. The problem is that they seem to adopt a similar approach on more major two lane roads, and that’s not going to scale! We get back late, but with dinner waiting. Tomorrow we move off to the capital, Thimphu.